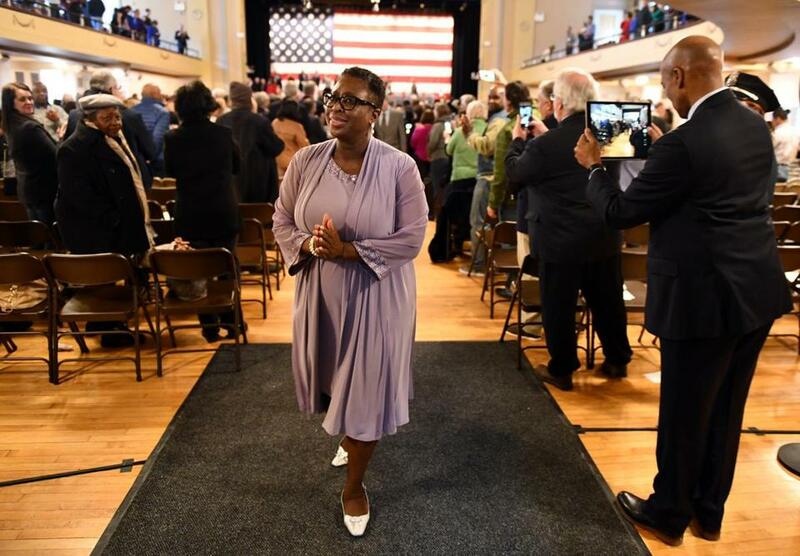 Yvonne M. Spicer reacted after being sworn in as Framingham;s first mayor. FRAMINGHAM — The words carved on the shingles outside, embossed on the windows, and even stamped on the lectern in the vast auditorium all proclaim this to be the town of Framingham, as it has been known for 317 years. But Monday it officially became the city of Framingham, as Yvonne M. Spicer took the oath of office as mayor. With her left hand on a colonial Bible held by US Senator Elizabeth Warren and her right hand raised, Spicer at once became the first mayor of what had been the state’s — and the country’s — largest town and the first popularly elected African-American woman mayor in Massachusetts. The 55-year-old former teacher and Museum of Science administrator won the mayor’s race by a comfortable 17 percentage-point margin in November, after decades of debate and a razor-thin majority last April endorsed a charter change. That called for replacing the New England hallmarks of Town Meeting and Board of Selectmen with a mayor and City Council. For many, that contest had less to do with how they saw Framingham — a place of both suburban subdivisions and large apartment complexes, where an agricultural and manufacturing past gave way to robust highway development but also a fatigued downtown, and where the population has grown steadily more diverse — than with simply which government type they preferred. Some saw the new system as essential for modernizing a place that recently surpassed 70,000 residents, too large and complex to be a town. Others worried that it would abolish the democratic spirit of representative Town Meeting, where people can bring potential legislation to the floor with just a few signatures. But she did not lose sight of the symbolic power of her victory. Neither did a joyous crowd that easily exceeded 500, which rose to give Spicer a long standing ovation. Some see Spicer’s election as a point of pride for a diverse community. Framingham’s 8,609-student public school district is 27 percent Hispanic, 7 percent African-American, and 5 percent Asian, according to state data. “From our first English settlers to the wave of Italian, Irish, Eastern European, Portuguese, Latino, and now our Brazilian community . . . . the fabric of Framingham has been strongly woven with the thread of diversity,” said Spicer, who thanked the voters of “our amazing new city” in Portuguese, Spanish, and Mandarin as well as English, with a sign-language interpreter by her side. She said her own family “looks like Framingham. We are African-American, Caucasian, Latino, Asian, Native American, Christian, Muslim, millennials, and older adults.” She imagined her own ancestors “smiling upon me today,” especially her late parents, Bill and Dot Spicer, gesturing over each shoulder and speaking with palpable emotion. Themes of family and diversity permeated the day, from the opening greeting in five languages by outgoing Town Manager Robert Halpin to an address by Dennis Giombetti, chairman of Framingham’s new 11-member City Council. Giombetti noted that the riser on the stage at Framingham’s Memorial Building — dotted with local, state, and federal officials and dignitaries — included new councilors Margareth Basilio Shepard, a Brazilian-American woman, and Edgardo Torres, who has Puerto Rican heritage. “What an absolutely glorious day for our city,” said Giombetti. And he imagined his late father — a son of Italian immigrants, and a municipal employee who started as a janitor in this very building — looking down with pride on the proceedings. That was in 1985, when the Brooklyn native — who had sometimes helped her mother clean houses on the Upper East Side, and heeded her emphasis on education — listened to her mother and relocated to Framingham for a teaching job. “Framingham opened its arms to me,” the new mayor said.